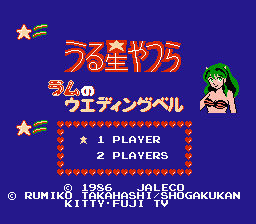 Play Urusei Yatsura - Lum no Wedding Bell online with Nintendo NES browser emulation for free! 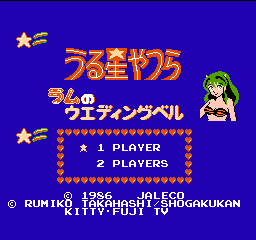 Urusei Yatsura - Lum no Wedding Bell (NES) game rom is loaded with features in our flash, java and rgr plugin emulators. Nothing to configure, we've done it for you! 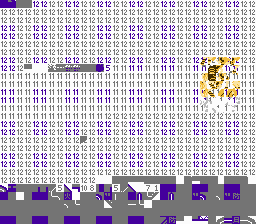 I Think I Broke Something?? Players take on the role of Lum, a female alien princess from the anime / manga Urusei Yatsura. 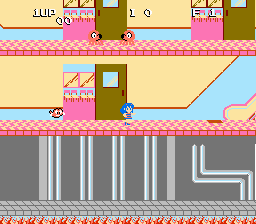 The game shows Lum going through different stages of her life (from childhood to adulthood) fighting off alien invaders, until she is finally old enough to marry Ataru. Gameplay stages involve climbing up several floors of a building in order to get to a waiting UFO. Lum can't dilly-dally though, as the building she is climbing up is on fire and the flames are constantly rising. Enemies are also in the way to impede Lum's path. Lum can shoot at these enemies with lightning bolts. 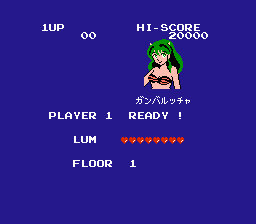 Lum can also pick up power-ups such as ones that can increase the players score, grant her temporary invincibility, and let her enter a bonus stage where Lum has to shoot down flying enemies. 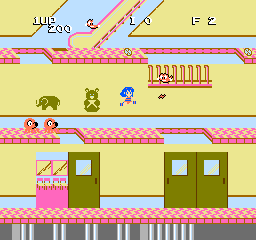 This game was also released in the arcades as Momoko 120. However, the graphics were altered because it lacked the Urusei Yatsura license.